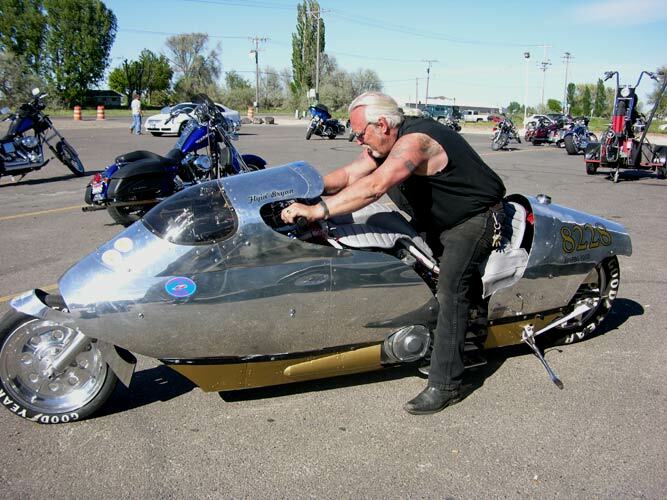 It costs a lot of money to run Mike Geokan's 139" Turbo Harley at Bonneville...Hotels, food, fuel, entry fees, engine and bike preparation....the list goes on and on. Thousands of dollars to go play on the great white dyno, get the hell out of town, eat casino food and go fast. Getting everyone together to support the effort also takes a lot of time, money, and energy. A benefit for Mike and Bryan seemed to be the best way to let people see the race bikes, meet the riders, and have a damn good time. 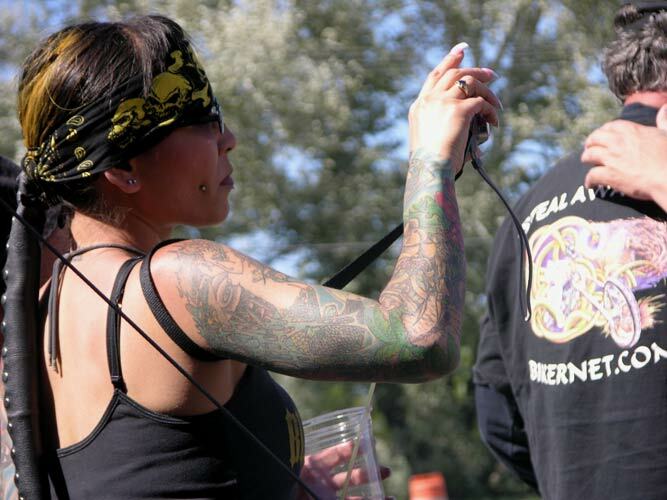 Bob-T from Chop-n-Grind Racing came up to judge the bike show and there was a bikini bike wash, a live band, lots of food and drink, vendors, and an auction with the proceeds going to the Bonneville effort. 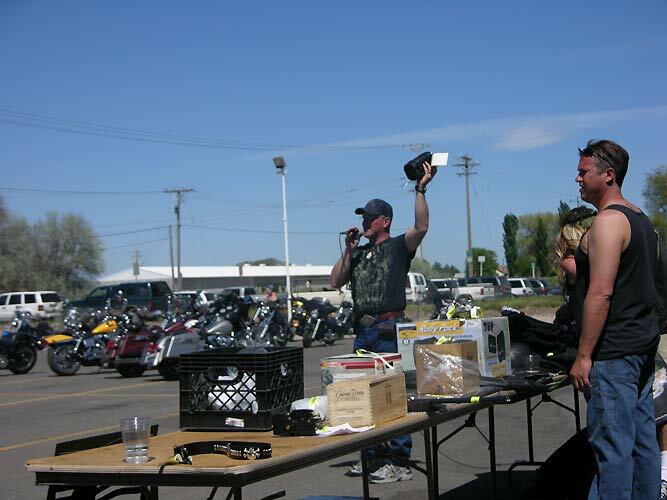 The first benefit was held in Burley Idaho and a second was held in Boise Idaho. Clubs began filtering in from all over. People came from out of state, driving many miles to support the benefit. 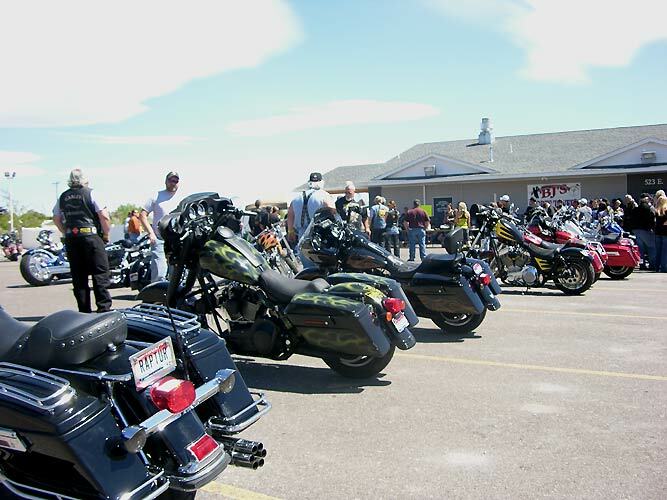 Rolling thunder in the Idaho countryside. 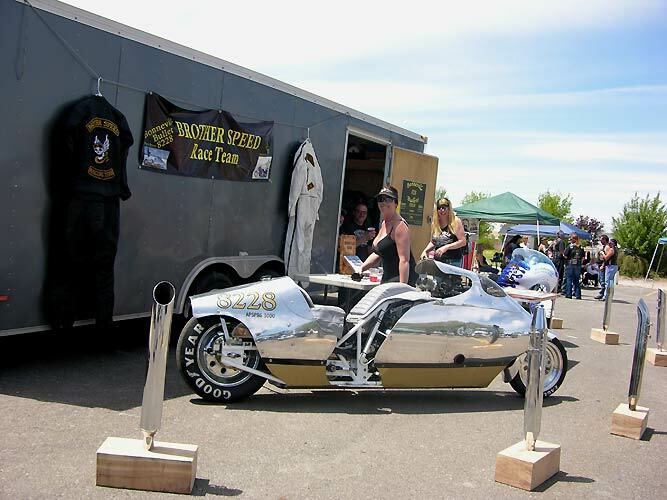 Mike Geokan with Dyan on his record holding (retired) #226 Bonneville bike. Mike let Bryan's son Nick Stock drive it around. 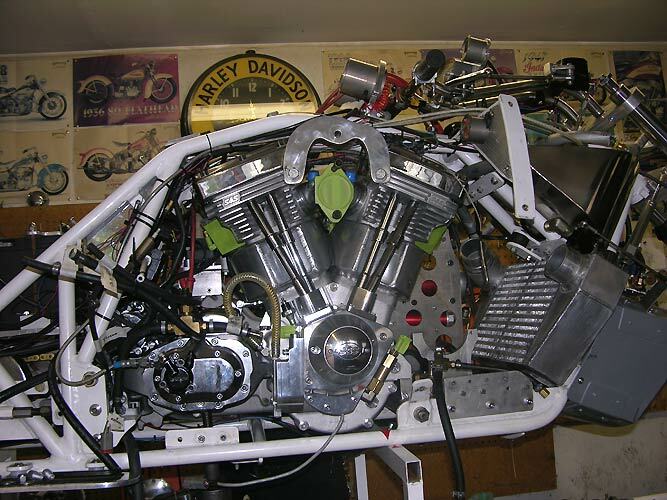 Sitting for years while the Bullett was being made, it started right up with a new battery and fluids. 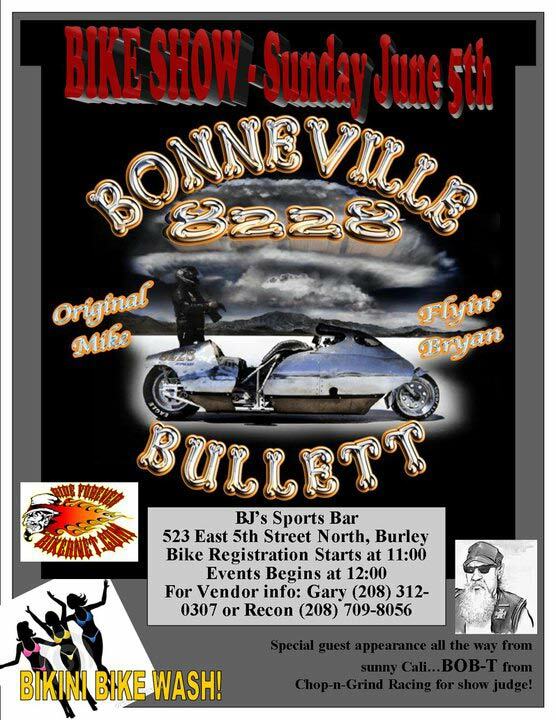 Bonneville T-Shirts, books and photographs were sold to help the cause. Mike's white racing leathers and Bryan's black leathers. There are no decals or logos save the Brother Speed Racing Team on the leathers. Carl Pelletier of Competition Motorcycles in Boise took the highly specialized 500 hp 139" Bullet engine down to ground zero checking everything and putting in new forged pistons with Peek skirt buttons and Xtreme Performance ceramic and moly coatings and reconditioned the McClure fuel rods and lower end. 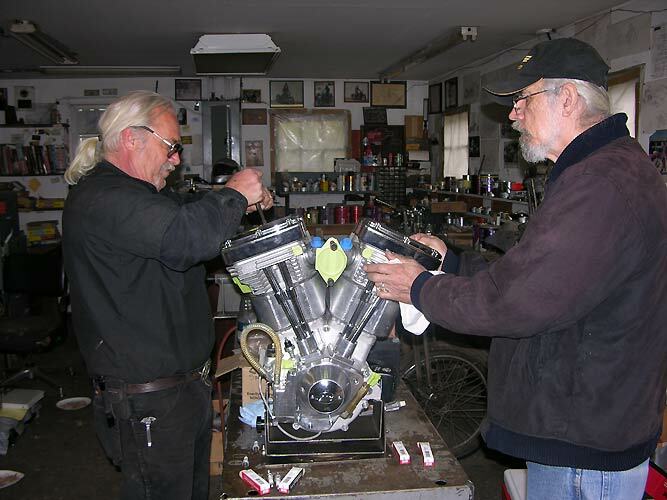 Carl delivered the motor on Thursday for Sunday's show and it fired up right away with the new battery. It's 1" taller than stock with a 4 3/8" bore and a 4 5/8" stroke. It's an impressive chunk of metal. Bryan Stock and Mike Geokan. 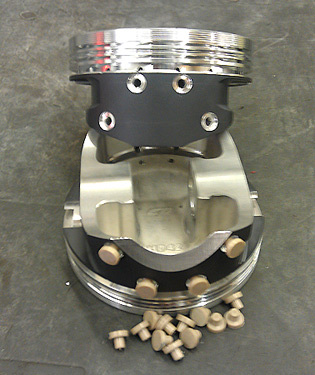 Carl builds and races Top Fuel and Pro Fuel Nitro motors and suggested that he put PEEK skirt buttons on 4 3/8" CP pistons due to the extreme heat and pressures the Bullett will see with minimal warm up time. 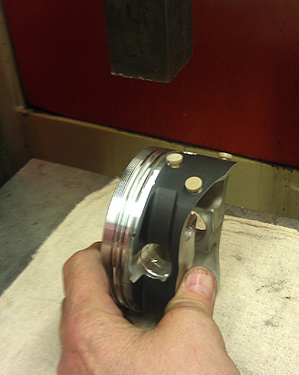 In Top Fuel the buttons keep the pistons alive as the Nitromethane washes the oil down off the cylinder walls. The PEEK material is really expensive and Carl machines the buttons in house at Competition Motorcycles. Special mill and lathe tooling and a press is required to do the installation. Carl figures the Bullett's gas powered turbo is in the Pro Dragster horsepower range that he has more than 10 years experience with and he has perfected the installation process. It takes a lot of people to make the Bullett run. Bryan Stock started up the Bullet and drove it around the parking lot at the Sports Bar after the event was over. You need to have your mind in gear when you roll around a 1000 lb 99" wheelbase bike with 45 degrees of rake. 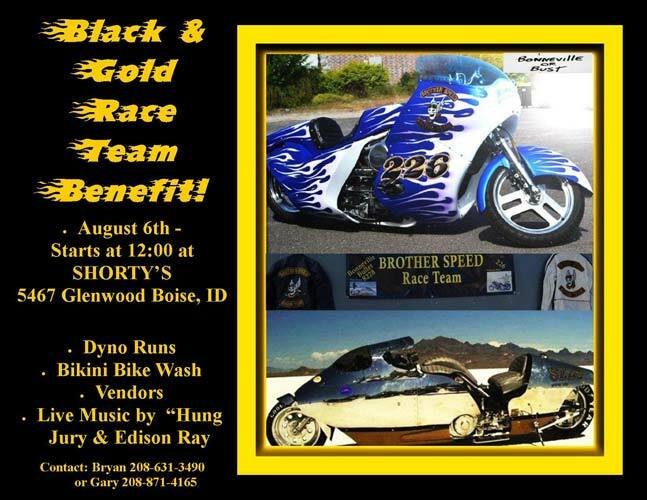 For 20 bucks a pop Bryan dynoed bikes all day long...the money going to the Bonneville effort. Everything is about art and commitment. At Bonneville the Bullett fits into a long tradition where individual expression and freedom still rule. Run whatcha brung. People marvel at the aluminum bodywork on the Bullett and those in the know understand what it takes to create from scratch. You are either all in or you're out. All sealed up with tape as delivered by Competition Motorcycles, back in the chassis, and awaiting the myriad of hoses, clamps and electrical connections...and the turbo. Auction was a big success with many donated items...everything from leather goods to instruments of destruction (thanks Bill). People ponied up and paid big bucks in some spirited bidding...all for a good cause. Gary (right) from the Brother Speed Burley Chapter orchestrated the whole event. It was a big success. The weather cooperated...Blue skies, warm weather and lots of beer and good music. 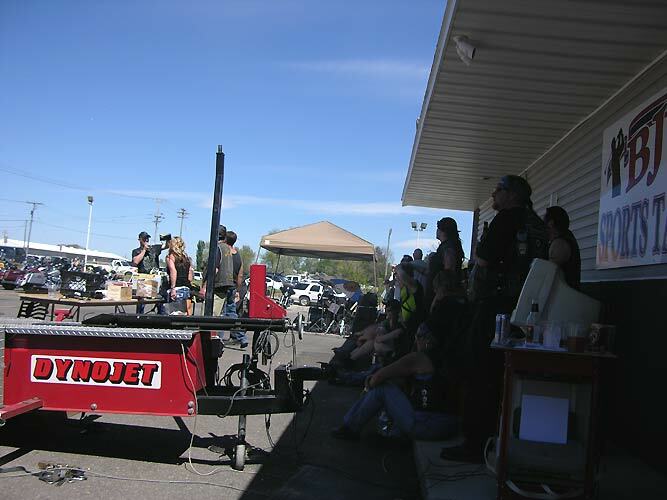 The Dyno and the band had to take a rest while the auction was going on. A second benefit was held in Boise, Idaho on 6 August 2011. Mike Geokan got to thank the crowd from the stage for coming out to support the Bonneville effort.